Magoria, City of Magic. It’s not the first city of magic in a board game, and not the second or third, either. But usually the magic in question is the kind with dragons, fireballs and floating lettuce. But not this one. Magoria is the first city of stage magic, of cunning illusions performed with sleigh of hand and miracles of engineering. It was founded decades ago by Dahlgaard the Magnificent, the greatest performer who ever lived. But ever since his retirement, the city has been in decline. Until now. Dahlgaard, foreseeing his coming death, has invited four magicians into a contest. The winner will be his successor and lead Magoria to new glory. You won’t be surprised that Dahlgaard’s two to four potential successors are the players in Trickerion. You might not realize just how labor intensive magic is. Sure, when David Copperfield lets the Statue of Liberty disappear you have an inkling that he has someone helping with that illusion. But for a more normal performance, sawing your lovely assistant is not the hardest piece of work, either. There is a lot of preparation for each show. Designing new tricks. Building your own hardware. Getting the corpse of your dead twin out of that water tank. What I’m saying is, there is enough work in a magic show that an illusionist might employ a team. Employees to send on errands in different parts of the city, to buy material, prepare things backstage. That sounds like a worker placement game, doesn’t it? Trickerion is indeed a worker placement game. Of sorts. You do send workers to different locations to take actions for you, but there is much more going on. You have different kinds of workers, to start with. That has been done before, but it’s important. Different kinds of workers in Trickerion have different numbers of Action Points: three for the Magician himself, two for the different kinds of Specialist, one for an Apprentice. There are four locations only in the base game. Two of them have one space per player. The third one has more, but they come with their own restrictions, and the fourth one is on each player’s player board and thus not under competition. Each space has another Action Point value that you add to your worker’s Action Points. That usually means coming early is rewarded. Even an Apprentice can take expensive actions if he arrives early enough to get two extra action points from the space. But if he arrives too late and gets no bonus, the same apprentice might be useless. Why would you even send him there, then? That’s where Trickerion starts to have more going on than most worker placement games. For each of your employees, you secretly decide where they will go at the start of the round. Only after all players made their decision do they reveal the cards. Then they take turns choosing one of their workers and sending him to the chosen location to do his job there. At this point, you know what the other players are planning. With that information, you can make a decision where to go first to get those bonus action points, but you usually have to give up on one of the things you planned to do in order to get another. Three locations doesn’t sound like much for a complex worker placement game, but each of them has multiple actions you can take there – even on the same turn, if you bring enough Action Points. Take the Downtown location, for instance. Here you may take money from the bank, learn new magic tricks or hire new employees. All of these cost three Action Points, the most expensive an action gets, and all of these are tied to a pair of dice. The dice are rolled before each round, so you know what you can get, but they restrict what is available. When taking money, you pick one of the dice and take that many coins. For learning new tricks, the dice tell you which specializations are available: mechanical tricks, spiritual ones, escapes or optical tricks. In your chosen category you have free choice of the available tricks. No random draws here, the only thing you need for the more advanced tricks are at least 16 victory points before you pick them. Finally, the dice for hiring employees tell you which ones are for hire. When hiring apprentices they only give you their worker disk. The different specialists each come with a small board that expands your player board and lets you have more materials, more tricks or more apprentices than you could otherwise have. Now that you have tricks and people working for you, what you’re still missing are components. You buy those at Market Row. 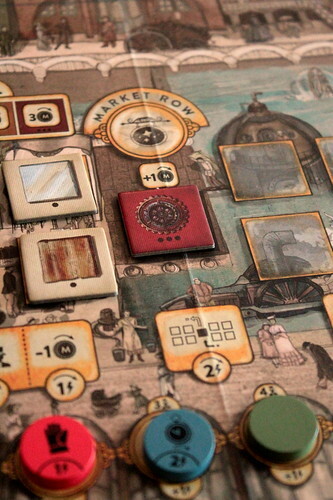 At the start of the game, you find the basic components – glass, cloth, wood and metal – here and can buy them immediately. If you need the more advanced components, you have to order them to be available next round. There is some strategy and interaction here because new goods arriving replace something currently in the market. If you have all the cloth you’ll ever need, but no one else has any, then you know where to have those padlocks delivered to. If you absolutely need something right now, you can also have it express delivered, but the added costs in money and Action Points make that a last resort. Materials bought, the next step to get that trick on stage is to prepare it. You do that in your Workshop, the location on your player board. A worker here can place a number of Trick Markers on a trick you bought – provided you have all the components of course. And then it’s finally of to the Theater! We want to perform, after all. To be famous! But wait, more work first. The Theater location is split into two sub-locations. Backstage, you set up your tricks by placing their markers on the Performance Cards arrayed along the board. 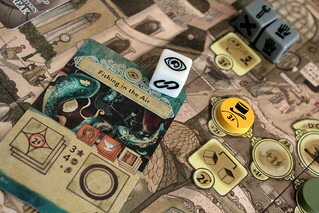 Placing those is another mini-game where matching symbols yields some extra rewards, but there are too many of those details in Trickerion to get into them in detail. Here’s what’s important again: a Performance Card does not belong to one player. Everyone can set up tricks wherever they like. Things get interesting when someone performs the set up acts with a worker on the stage in the Theater. Somewhat obviously, only a Magician can do that. He picks a Performance Card and becomes the lead performer in that performance. Other players with tricks set up on that card come into the show as guest performers. They perform their own tricks and collect the rewards for those in money and victory points. The lead performer earns the rewards for his own tricks, plus the reward from the Performance Cards, plus extra rewards for specialists helping out backstage. Leading a performance is clearly more profitable than being a guest performer, but making your way into every single performance is a workable strategy as well – especially because it frees up your Magician and his three Action Points. Then you pay your employees – you didn’t think they work for free, did you? – and the round is over. Do that five times and count victory points. That’s it, at least if you’re playing the base game. Or, as we have come to call it, Trickerion Light. It’s an unfair nickname because baseline Trickerion is a pretty heavy worker placement game already. But the box contains two expansions, and I firmly believe that you should always add at least The Dark Alley as soon as you feel comfortable with the base game. The Dark Alley is a new location on the board with two actions to be taken there. The first lets you take Assignment Cards, the ones you use to send your workers places. In the base game, it’s so rare that you miss one of these cards that you might as well consider them unlimited. But with this expansion you start with fewer of them and will quickly be desperate for more. That’s when you visit The Dark Alley. The cards you buy here are one time use only, so getting the right cards at the right time needs more planning. But there is a reward: they all come with a special ability you may use when you use that card. The other completely new element in this expansion are the Prophecies. Three of them swirl around the crystal ball, and you can influence which will come to pass by spending Action Points in the Dark Alley. Prophecies change one rule for the next round. The good ones might award extra points for setting up the right kind of trick, or they might double all bonuses for the lead performer in a performance. But a bad prophecy might make all workers only have one action point next round. Either way, you really want to be prepared for what’s coming, and Action Points spent choosing the prophecy that helps you most are never wasted. On top of those two new elements, The Dark Alley also extends the game to seven rounds and adds a third tier of tricks, unlocked at 36 victory points. In addition to being profitable, those tricks each have a way to win extra points when the game ends. Yay, more to plan for! Like I said, I consider The Dark Alley the way you should play once you know the game. But it’s not the end of the line. When you’re comfortable with The Dark Alley, you can still add the Magician Powers expansion to the mix. It builds on top of The Dark Alley and gives each player a random selection of special powers they can use during the game, but only after they pay for it. Having to buy the card first takes this expansion from being random to being yet more strategic, because you only want to buy the ones that actually help you. 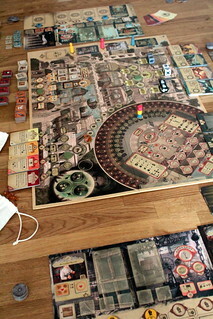 Worker placement games are usually on the more strategic end of board games. But among those, Trickerion stands out as needing more strategy than most. There are a couple of reasons for that. First, everything is very, very limited. You don’t have enough time, or enough money, or enough space for everything you want on your player board. Second, and tying into the first reason, tricks are rather expensive in components. You definitely don’t want to buy the Vanishing Elephant trick on a whim. You want to buy it after you had some simpler tricks using some of the same components. If you don’t have most of the components already when you can finally buy a top tier trick, chances are you won’t ever get it on the stage. Ideally, you want to have your selection of tricks worked out before the game starts to make it work. You actually start to put your strategy into action before the game starts. You have a couple of choices during setup, including your first trick, first components and one specialist. This is where you start building your victory, and if you mess it up you might not catch up. Careful planning is key. But fortunately you can plan. Trickerion has some random elements, but you have the tools to deal with all of them to pull of your strategy, and doing so is very rewarding. The downside of those deep long-term decisions is the usual: people take time to make them. When playing Trickerion, it’s pretty much a given that you will sometimes wait for an opponent to figure out which trick they can actually put together without spending a fortune in components. Downtime is to be expected in a game this deep, but the warning doesn’t hurt: if everyone takes the game seriously and plays to win, you will wait. Fortunately, this game comes with the tools to minimize the waiting as much as possible. As a player aid, each player has booklet listing all the tricks, so they can search and plan without looking at the one stack of cards. It’s a simple thing, but it makes a huge difference. And that’s just one of many good decisions that went into Trickerion. Despite the many options you have to act, there is no fat on the game, nothing that could be trimmed that wouldn’t be missed. Of all the possible actions, none are so-so, none are situational. 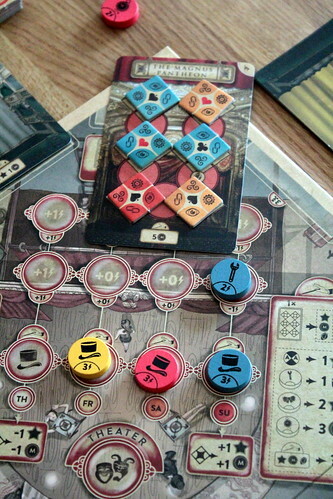 The only reason why you might not use some actions is because you don’t get them, because Trickerion is also tight. When players start hiring more workers the action spaces are suddenly very limited and you’ll have to make some tough decisions what you do first and what you might miss out on. Trickerion is a heavyweight among worker placement games, and I say that in a strictly positive sense. It’s deeply strategic, lets you make many decisions, looks great – really, the only downside is occasionally waiting for your turn. And if you want a game with this depth and this many details to keep track of, then you’re probably prepared for that.